A peaceful background to combat noise pollution, noisy neighbors, construction, airports, traffic, loud parties, or busy offices, Soniscape creates a peaceful environment to allow you to sleep, work or relax. 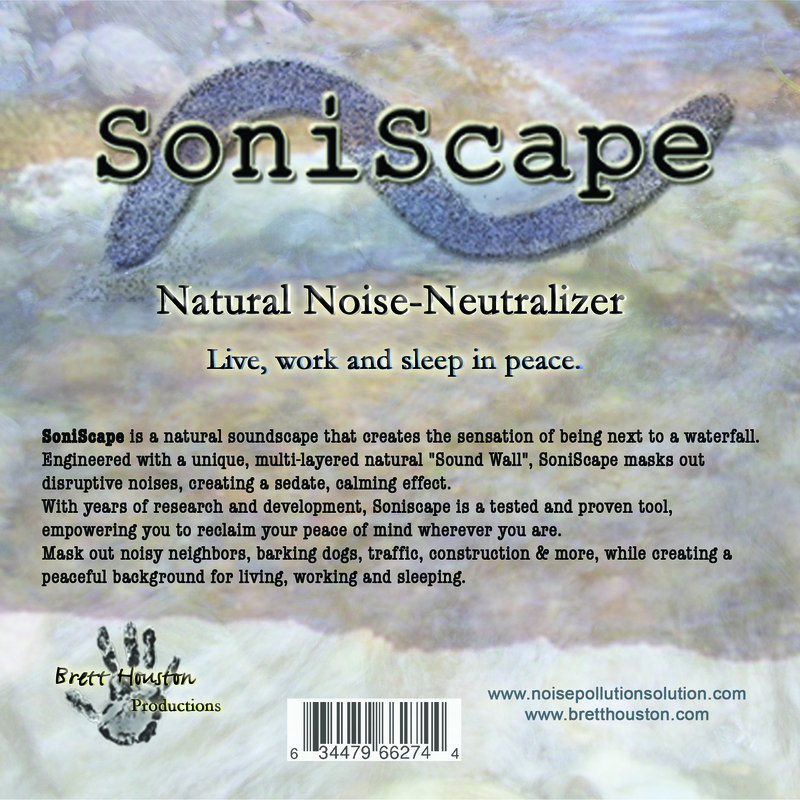 SoniScape is a noise neutralizing soundscape composed of multi-layered natural sounds that creates the sensation that you are surrounded by a waterfall. It is engineered to mask out disruptive noises in all audible frequency ranges while creating a sedate, calming effect. SoniScape provides a peaceful background for living, working and sleeping. This video covers most everything you ever wanted to know about SoniScape,as well as an example of effectiveness. Click to hear a sample. Get your SoniScape CD by clicking the link below. Sorry, physical CDs are sold out at this time. To make our SoniScape CDs we only use top quality CDs. They are burned at slow rates to ensure the best quality reproduction. Each disk is produced in our studio, not in a mass production replication plant. These disks are more expensive and take longer to produce, but are much better quality than mass produced product using cheap, replication grade CDs. Which means that they will last longer and sound better. We found by testing that the cheap replication disks will wear out and eventually fail when played over and over for extended periods. We stand behind our disks, if you have any problems with yours, we will replace it. Well, within reason anyway, if you use it to play indoor frisbee with your dog that would be an exception. Secure CD sales transactions are handled through CD Baby. MP3 tracks work great for traveling on planes, trains, automobiles or anywhere else you need a little peace to help you relax or sleep while mobile. Also available on iTunes for $9.95 Just open iTunes and enter SoniScape in the search option. A new audio format has allowed us to make a SoniScape that will play for 10 hours continuously. It can be included on an audio DVD (The disc does not contain video) or a digital downloadable file. This track includes a new mix that has a stronger low frequency noise mask that is even more effective at masking noisy low things such as upstairs neighbors stomping, thump mobiles, neighborhood garage bands and anything else that’s low down… It sounds really nice, in addition to the running waterfall this version includes a subtle mix of crickets and night river frogs that make you feel like you are sleeping near a mountain stream under the stars. This DVD will play in a DVD player or any computer with DVD capabilities. It will not play in a CD player. The digital download is either CAF or mp3 and will play on most any digital device. It is a large file at 1-1.5 GB depending on chosen format. So only choose this option is you have high-speed internet or a lot of time and patience. The SoniScape Mega track is $34.95 for DVD or $29.95 for digital downloadable version and is only available in limited quantities through this site. Payment available via Paypal. SoniScape has a Facebook page. If you like to “like” things, you can like us there. We’d like that. Download SoniScape “tips for use ” tutorial. This short guide will give you all the information that you need to most effectively use your SoniScape. SoniScape is a “natural-sound” composition designed to mask out disruptive noises while creating a sedate, calming effect; providing a peaceful background for living, working and sleeping. 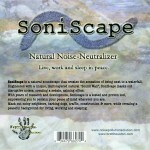 SoniScape functions similar to “white noise” generators or “noise-canceling” devices. However, SoniScape works more effectively, is enjoyable to listen to and is much more affordable. And, since it comes on a CD or MP3 you can take it anywhere. SoniScape sounds great but it is not just some pretty sounding nature CD. 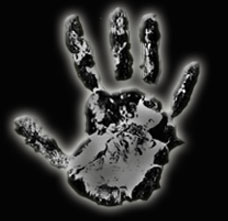 SoniScape is engineered with a unique “Sound Wall” track, which is comprised of multiple tuned layers of natural sounds. This allows SoniScape to cover the entire audible frequency range, from the lowest thumping bass to the highest screaching car alarm, and serve as a total sound mask to not allow other disruptive sounds to pass through; providing you with a serene, natural background. It also works the other way around, if you are in an environment/profession where your conversations need to be kept private, SoniScape can help protect your secrets from curious ears. * Camping in RVs or tents in crowded campgrounds. *Or any other time you may want a serene sound barrier against noise pollution. For commercial applications it serves as a nice background for businesses such as a dentist or doctor’s office, retail store, massage therapist, spa, hotel, retirement center, asylum or school. It can be used for sensitive private meetings to mask-out your conversation to others that may be eavesdropping. Soniscape can help create a nice environment for cubicles, lobbies, break rooms, board rooms, padded rooms, study rooms or even outdoor landscaping. 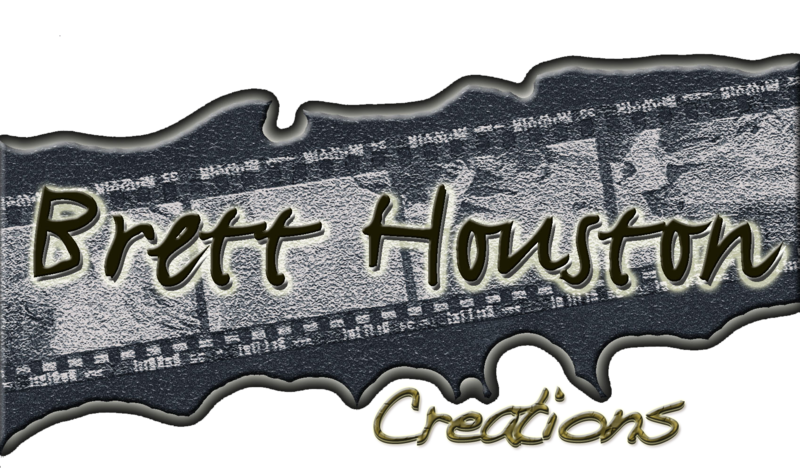 Additionally, it can save you money as it does not require royalty payments to ASCAP or BMI for use in public domain. *Children, (yours or someone else’s) Parents, (knocking around while babies are trying to get in a good nap) I have recently found this to be an indespensible tool to soothe my infant daughter, wether in the car on road trips or in her room for naptime. *Whether you are disturbed by noise pollution or not, you will enjoy the environment created by this recording. Here’s an old video of typical life underneath the neighbors that inspired me to create SoniScape. SoniScape makes use of the technique called “sound-masking”, which is to basically to hide one sound behind another of a similar frequency. It was created using several layers of natural “base” sounds that were tuned, equalized, transposed and blended to cover the entire frequency range that humans can hear. This functions as the masking portion of the track. 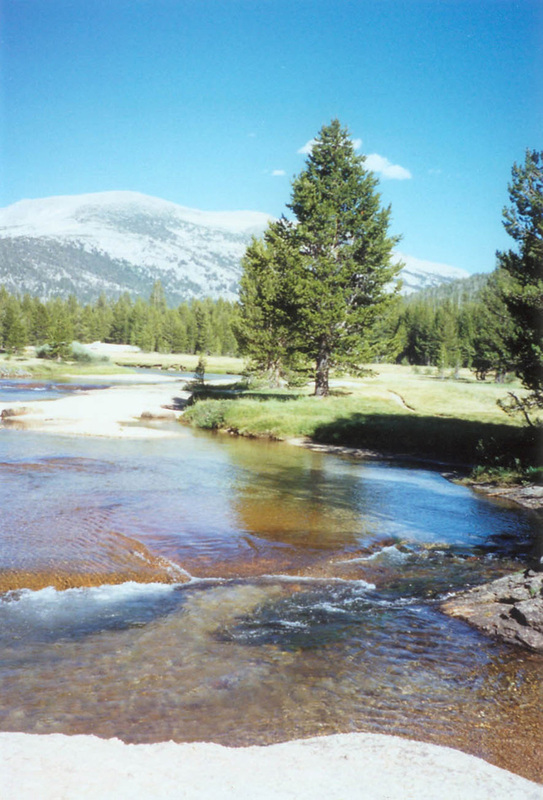 Several “top” layers such as mountain streams and waterfalls were then added to create the sense of being in nature. SoniScape took over 2 years to conceive, develop and test. As you listen, you consciously tune into the sound of a waterfall. Although, there are actually 12 different layers of sounds working together to create a sedating effect that masks out disruptive sounds. SoniScape will mask most any sound as long as it is slightly louder than the offending noise, while played on a full-range (20hz-20khz range) sound system. In other words, using it on your laptop speakers to cover low frequency rumbling from a neighboring garage band rehearsal/house party (although helpful), will not be adequate to completely cover the audible onslaught. It has nothing to do with SoniScape’s capabilities but the fact that laptop speakers can not produce low bass frequencies. However if you use a full-range speaker system with a sub woofer it is very effective, ensuring that you will rest peacefully undisturbed while the mayhem goes on around you. The other added benefit I have noticed from years of use is that it creates a calming effect on people and pets. This is another component that helps one deal with noise issues, and when used in peaceful situations is a great standalone tool for promoting relaxation. Here is a link to a letter I wrote about other possible solutions that you can try to solve your noisy neighbor related issues. Soniscape was designed to maintain a constant, steady flow of sound. This allows it to be used for indefinate periods of time without fatigue. This also permits you to think clearly or have a conversation without distraction; and, for use while sleeping, it will help you rest undisturbed. By using the EQ controls on your stereo you can custom tune the track to adapt to your environment. For example, if you have noisy upstairs neighbors who stomp around a lot or play music with loud, thumping bass you would turn up the bass on your track. If you are hearing car alarms or honking at 3 am you might tune the EQ to a higher frequency. It works best to surround yourself with the speakers. Basically, sound is a vibration; you can use the vibration of the SoniScape from your speakers to knock down sound waves/vibrations from the disturbing source. For example, place the speakers above your head for upstairs neighbors, or on the floor for downstairs neighbors. If you are dealing with traffic noise, place the speakers facing the windows, etc. Feel free to experiment for best results. SoniScape is most effective when played on a hi-fi system using 3-way speakers containing a 12″ woofer. Even better, try a 5-1-surround system with sub-woofer! A strong bass response is key, as bass will cut through brick walls like butter, you need bass to fight bass. The track is over an hour long and can be looped indefinitely by selecting the “repeat 1” mode on your CD player for continuous play. An important key to successful noise masking is in your sound system configuration and speaker placements. Feel free to contact us for advice using your existing system for best results or concerning our professional system sales, installations and configurations for commercial or residemtial applications. Download full SoniScape “tips for use ” page. SleepPhones is an innovative new product that allows you to sleep wearing comfortable, high quality headphones, (with a strong bass response) and play your SoniScape. It works great with your Ipod! Click here for more info. School for champions includes some great info on the science of noise! We are working on a new home security track that can be played in a loop while you are gone that leaves would-be burglars the impression that you are home. So much more effective than leaving on a tv or lights on a timer. Also, in response to popular request we will soon be releasing a new track to play for your disrespectful neighbors that will serve as a “training aide”, helping them to realize just how bothersome suffering through someone else’s noise can be. Send us an email if you are interested and we can put you on the waiting list to be notified when they are released. For those of you who are interested in knowing more about the infamous “Instant Kharma Machine”, here’s a fun video. The IKM was a a noisy neighbor retraining device I created to deal with some HORRIBLE neighbors. It was a very effective tool for urban warfare, however it didn’t do much to help me sleep like SoniScape did. ..